Make a splash all summer long with the Intex Easy Set®, one of the most easy to assemble pools on the market. This is a perfect starter pool and you can be sure to find one in our line that will fit perfectly in your backyard. Ready for water in minutes – simply spread out on level ground, inflate the top ring, and fill with water! My kids love this pool,and I love this pool because I get a break when they spend all day playing water games giving me some me time.I love how easy it is to put up clean and filling up with water, the pump keeps the pool clean all you need is to put in tables of chlorine to keep you water clear and this pool will give your family hours of fun. I amazing pool.. Lovely i am using this pool in our family persons..
As a family time loving person, I bought this pool for our backyard for our family enjoyment. The pool is big enough to fit at least six people and enough space to play in the water. It comes with a filter to help keep it clean while in use. When we chose it at our sports store we were super excited about taking it home to inflate and use. We soon found out that although it is sturdy and big enough for our family to enjoy at once, the bottom of the pool is the one flimsy part of it. When you set it up and sit up on the grassy part of your backyard, it doesn't stay as upright as you would like it to be. Also, if the grass you sit the pool on is lopsided or on uneven ground, then the pool with take the same uneven shape making it a little bit uncomfortable to sit in for a long time. We had to place ours on the concrete part of our backyard in order to able to enjoy it better. I think that the bottom of the pool is the one part that didn't allow me to give this product a higher overall rate. When I purchased the Intex 15 ft x 48 in, I was an expert by then on setting up this type of swimming pool. I had previously bought 2 other smaller sizes, and had helped set up a couple when my neighbors bought theirs. This pool is the perfect size for adults to relax on a float while the children play and enjoy the water. The pump that is included works great, filtering out everything from sand to sunscreens that pollute the water. I found it much easier to maintain this pool which is much larger than the precious Intex pools. I like the size. and felt that it fit our families size, so I bought additional items like the heated cover. and lights that light up the water at night. 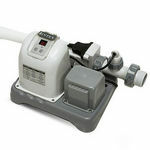 Now if you think owning a pool doesn't come with extra costs you are wrong, be prepared to spend on the basics such as chlorine tablets, shock treatment, water test kit to check chlorine levels, filters, and a pool this size I'd recommend a vacuum to collect debris on the bottom of pool, and a skimmer for the top of the water. Leveling the pool can be a challenge, I recommend a type of sand that packs together, to sit under the pool, I was able to level it by stacking it and the sand was tightly packed. Then I added literally 5 tons of the white sand from our Rock Quarry that gave us the feeling of being at the beach. A ladder is included and serves it's purpose, I always keep a bucket to rinse our feet off before taking a dip. This really is a great investment that our whole family enjoyes, it comes with added cost, but it's well worth it in the end! Had this pool for a while. Its not a bad pool to have around if you're looking for something simple to cool off in. It can be fairly easy to set up, though you need to get it on fairly flat land. Its obviously not the type of pool you swim laps in, but does make for some other fun things to do. Whether its just cooling down on a hot day or floating to relax. Kids can also find some fun games to play in it. Because of the material, it can pop if poked with something sharp enough, or if you have a dog that might try to bite into it. Storage can be easy, and it can be deflated for winter or any other reason. Because of its smaller size, that also makes cleaning easy. Small kids might be able to jump in, but anyone else should probably not do it. It does fit a few people as well. You definitely do get a good bang for your buck, and can last a few years before needing to be replaces. just don't expect it to be like a regular in ground pool. Great pool to set and go!